This is a plan of freehold and leasehold property to be sold at auction. The premises were previously occupied by the Post Office and were sold when the office moved from Lombard Street to St Martin le Grand in 1829. The estate is divided into 14 lots, delineated by pecked lines and coloured. 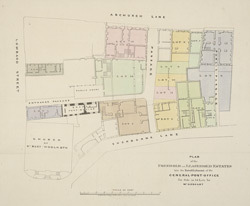 A note at the lower right states that the lease of Lot 4 is held by the Drapers Company.